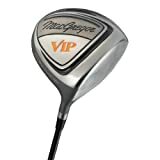 The MacGregor VIP Driver is fitted with a lightweight high quality, super smooth silver/black 60g graphite shaft. The sole contours are designed to reduce drag and improve the club head speed. The 460CC Titanium wide body aerodynamically shaped head lowers the Centre of Gravity promoting high flighted drives for the lower club speed golfers. The MacGregor 460cc VIP Titanium Driver features an Aerodynamic Crown structure designed to lower the Centre of Gravity. Macgregor have gone back to the label that made them so great on tour in previous years – but with a sound price and based on real value for money.